Purpose: Users with permission to edit sessions can tag access sessions that should be automatically locked when the last host disconnects from the session. When the last host disconnects from an access session that has been tagged in this way, the extension queues a tool to run on the remote machine. The tool executes a small batch script that calls into the Windows API LockWorkStation, which locks the guest machine. This extension only applies to Windows access machines. Version 1.0.1 of this extension has been released. The update adds a "Disable Lock on Host Disconnect" command to the host page in order to remove the LockOnDisconnect tag from selected sessions. Is there anyway to get some sort of icon or identification that the session has this feature enabled? I will investigate ways to make it more apparent which sessions have the feature enabled. Can any of the values be changed to enable lock on disconnect for clients by default, and then allow toggling from there? Okay. But then any machines added after that will still not default to that, so we'd have to do it manually? 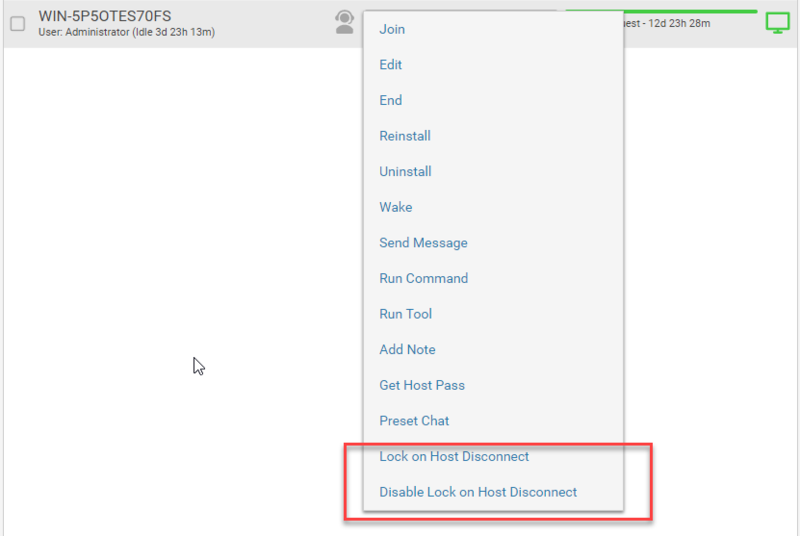 Correct; however, you could build an access installer in such a way that custom property 6 is set to the value "LockOnDisconnect" so that the machine will be locked on host disconnect by default after it calls back to the server. We use to autolock servers on disconnect, which works great as we already have an identifying field for the value "Server" for grouping purposes. Question: is it possible to suppress the menu entries for enable / disable since we don't use those? Probably removing a couple of lines of code would do the trick but I don't want to make that edit without knowing which lines to remove. I just discovered this extension and tried using it, but none of my selected computers actually will lock upon disconnect. Am I "disconnecting" improperly? All stations are Windows with mix of servers, Win10 and Win7 but none will lock after I close the remote screen. I would love to have this working! Are you right clicking the sessions for which you want the guest to lock on disconnect and selecting "Lock on Host Disconnect"? Can you confirm that if you look at the timeline tab after disconnecting from the session, you see a QueuedTool event with data lockWorkStation.scapp? Is there any documentation for this extension? I expected the command to issue automatically upon disconnect. I mean, isn't that the point. But since you mention right clicking the sessions for which you want the guest to lock on disconnect and selecting "Lock on Host Disconnect", I just tried that and all I get is some quick flashing box onscreen (processing something?) but no command is queued and no screen gets locked. 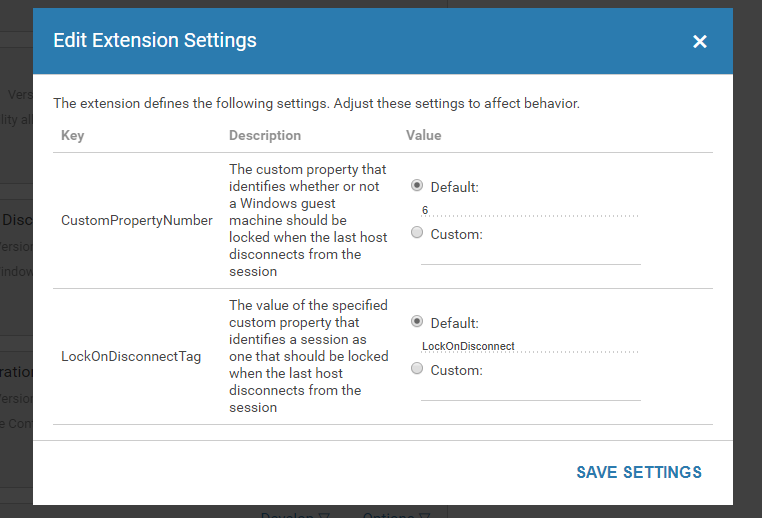 You have to tag the sessions you want to lock on disconnect by right clicking on them and selecting Lock on Host Disconnect -- this updates one of the session's custom property values to mark the session to be locked on disconnect whenever the last host disconnects from the session. The black popup is the tool running on the guest machine -- the tool just runs a bat file that calls a native Windows library function to lock the machine. You may also find the newly released Advanced Configurator extension useful for modifying app.config settings. The Lock Guest Machine settings are found under the Application Configuration > Quick Settings section on the Admin Page's Configuration tab (you'll need to install the extension before the Configuration tab is visible. wouldn't it be better to use the Notes feature for the tagging functionality instead of consuming one of the limited CustomProperty resources we have at our disposal? I can absolutely look into making the extension interrogate notes vs. a custom property value. Version 1.0.2 of the Selective Lock on Disconnect extension has been released. Awesome! It's working perfectly with the Notes feature, and now I can still use CP6 for my software inventory. Thanks, Ben! Well, mostly good. It leaves the scapp and bat in the users' documents folder afterwards. Can removing these leftovers be added to the extension? Or an option to remove them? would it be possible to add a stylistic element to devices tagged with LockOnDisconnect, perhaps at the end of their device name, to indicate that it's going to lock when I disconnect? This would be useful for other tags I use as well, such as when I need to turn a device "OffWhenDone"
Would creating a session group to pick out machines tagged to lock on disconnect work in this case? Where [Field] LIKE [*Value*] USE [Icon]. [Field] would be a dropdown list, containing each CustomProperty# and Notes. [*Value*] would be a freeform text field. [Icon] would be a grid selection list where the user could choose one of the Font Awesome icons to include with an ":after" CSS rule. This would provide a visual cue as I scroll through which devices were accessible to Tammy, which ones were paid support plans and which ones will lock on disconnect, all within the primary device info section. These values are often as important as the device name, so should be included directly. I'd be okay with them having a row of their own (like where a CustomProperty would normally display), but I'm not hung up on that as long as it's displayed within the primary device list. Ben, does this override the app.config setting? In general, we lock all of our devices, except we have a small subset that we'd like to disable this. I'd rather not have to do a re-install for all the devices to disable this app.config setting just to switch over to the extension's method of locking if at all possible.